Nokia 6.1 features a 5.8-inch full display with 1080x2280 pixel resolution, with 2.5D Gorilla Glass 3 protection and 19:9 aspect ratio. 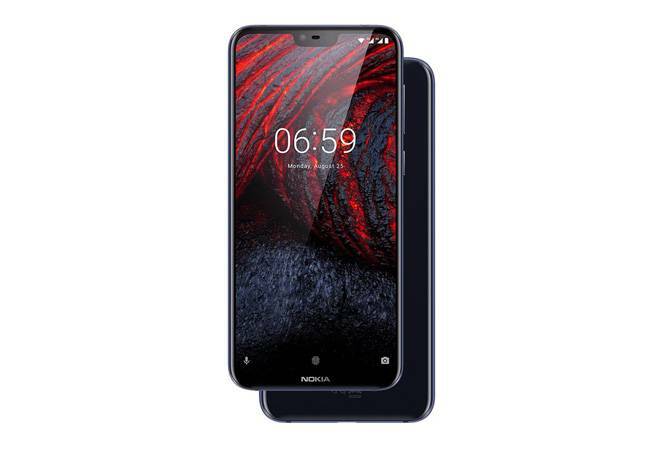 HMD Global, the official licensee of Nokia smartphones and tablets, has announced the launch of two new phones in the Indian market. The Nokia 6.1 Plus is a mid-segment device, priced at Rs 15,999 and will go on sale on nokia.com/phones and Flipkart from August 30. The company has also unveiled Nokia 5.1 Plus in the country, which will be available in September this year. Both the smartphones are Android One devices, focussing on clean user interface, security and timely updates. Nokia 6.1 features a 5.8-inch full display with 1080x2280 pixel resolution, with 2.5D Gorilla Glass 3 protection and 19:9 aspect ratio. It is a mid-segment device running Android 8.1 Oreo, is powered by Qualcomm Snapdragon 636 SoC, coupled with 4GB of RAM. This is a dual-SIM (Nano) smartphone with a 3060mAh battery and Quick Charge 3.0. The smartphone boasts a dual rear camera setup, with one 16-megapixel sensor and another 5-megapixel monochrome sensor, with f/2.0 aperture. There is also a 16-megapixel front camera with the same f/2.0 aperture. Nokia 6.1 comes with 64GB of inbuilt storage, expandable via microSD card (up to 400GB). In terms of build, the Nokia 6.1 has an aluminium body with 93 per cent glass surface at the front. Nokia 6.1 is a mid-segment smartphone that competes against the recently launched Xiaomi A2, Honor Play and Asus Max Pro M1. Nokia 5.1 Plus, on the other hand, also features a 5.8 HD+ display and is powered by MediaTek Helio P60. The phone features a dual camera set up at the rear, 13-megapixel and 5-megapixel, and an 8-megapixel front camera. It has a 2.5D curved front and rear glass, complemented by curved edges and a CNC-machined metal camera bezel with optical glass window and high gloss finish frame. Both the phones employ the AI-based algorithm, for AI assisted Portrait Lighting and AI-enhanced dual-sight. Ajey Mehta, Vice President and Country Head - India, HMD Global, says, "The Indian consumers are a top priority for us. We constantly work to understand their needs and enhance the experience on our phones to better suit them. The launch of Nokia 6.1 Plus and Nokia 5.1 Plus represents an important milestone for us in India. We have a strong presence in the offline space and with these phones today, we are strengthening our reach to our online consumers and their needs." HMD Global has been present in the Indian market since last 20 months and has 550 exclusive distributors covering 110,000 outlets in the country. The company has also opened around 400 care centres in the county. The brand has also partnered with IPL team Kolkata Knight Riders.